One September afternoon in 1932, when Harold Nicolls was five years old, his mother took him to Arlington avenue to visit his grandfather, Isaiah Engle, who would be arrested a few years later for performing a lewd act in public in Gaston park. Harold was playing outside the house when he chased a ball out into the street and was hit by a car. He was unharmed by the collision—cuts and scrapes—but he fell onto the car’s broad front bumper and was carried some way down the street before the driver stopped. It may have been his first journey by car. By the time Harold was thirteen, he had developed a habit of driving around town in cars whose owners had left their keys in the ignition. One evening toward the end of winter, he and an eleven-year-old boy were arrested for stealing a delivery truck from behind the Kirk Hutton store and taking it for a joy ride across the Diamond and down East Jefferson street. They were sent to the George Junior Republic, a privately run correctional institution for delinquent boys, where Harold would spend most of his teenage years. He began his twenties in the Allegheny County workhouse, where he had been sent for one to three years after being caught riding as a passenger in a Buick that had been stolen by his friend. 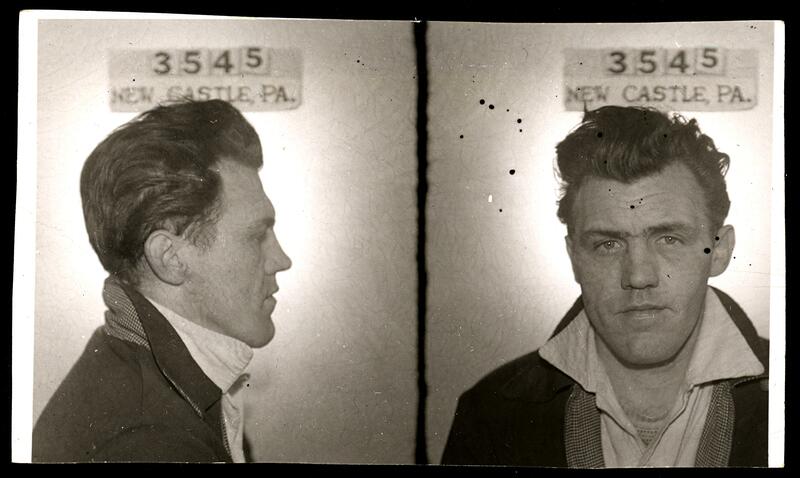 He was released on parole after eighteen months, but was soon arrested on two charges of burglary, nine of larceny and one of malicious mischief, and returned to jail in September 1949. He remained there for the next four years. On his release, at the age of twenty-two, Harold moved in with his mother on Valley street. A year later, he served two months in the county jail for driving while under the influence. The following year, he was caught selling cartons of cigarettes that had been stolen from the East street market and was sentenced to another two months for receiving stolen goods. He was still living with his mother in 1958, when his girlfriend’s fourteen-year-old son, James, was found wandering near the Diamond at three in the morning and told the police that he had left his home after Harold had strap-whipped him. Harold admitted using his belt on James, but said that the boy’s mother had asked him to do it. He was charged with assault and battery and fined $50. Harold drove a cab in the sixties and by the end of the decade, just after he turned forty, he had become the owner of a small cab company that operated out of White street. During the seventies, Harold’s drivers began to report that they were being held up and robbed by their passengers. Some of the stories were true; some were invented by drivers to cover up their embezzlement. Harold tried to operate as normal for as long as possible but, as the decade wore on, he was forced to reduce services, especially after dark. The robberies continued until the company closed down in 1977. Harold died in New Castle in 2005, at the age of seventy-eight. Sources: New Castle News (10 Sep 1932, “Three Children In Auto Mishaps”; 1 June 1938, “Charge Is Preferred”; 19 Feb 1941, “Two Small Boys Steal Truck, Auto”; 27 May 1942, “Around City Hall”; 25 July 1946, “Hold Two Youths For Auto Larceny”; 27 July 1946, “News On Court House Hill”; 3 Jan 1953, “Court House”; 5 Aug 1953, “Wave Delores Nicolls Home On Naval Leave”; 26 Feb 1955, “Many Are Up For Sentence”; 5 July 1956, “Two Boys Admit Burglary Attempt, Market Entered”; 9 July 1956, “Two Plead Guilty To Market Burglary”; 30 Aug 1956, “Four Ordered To Pay Money To Railroads”; 31 October 1956, “Dottle, Nicolls Released From Jail”; 9 June 1958, “Mother Of Three Pleads Innocent To Two Charges”; 4 Oct 1958, “Court Imposes 37 Sentences In Long Session”; 9 March 1961, “Court House”; 19 Nov 1968, “Six New Cars”; 20 March 1972, “Holdups Worry Cab Firm”; 8 Oct 1973, “Cab Driver Faces Count Of Robbery”; 10 Feb 1977, “Taxi Driver Claims Theft At Knifepoint”); Lawrence Law Journal, Vol 12, 1953, pp1-4. Another great post. Keep it up. Thanks, Andrew. I’ve still got a pretty big box full of mug shots, so I reckon I’ll be able to keep it up for a while yet. I think he looks just like Roger Daltrey out of The Who. Well, maybe not JUST like him, but enough to be going on with. “It may have been his first journey by car” may well be my new favorite sentence.